In this guide, we’re going to map out a simple step-by-step process that will help you and your company get seen by the people that are on the hunt for your particular product or service. We’ve all searched for something online. In fact, Google processes on average over 40,000 search queries every single second. All around the world people are continually asking the internet about this and that and more. And it’s what we type into the search engine that’s the key here. A ‘keyword’ is a single word, a phrase, or even a whole sentence, that is entered into the search bar to solve a problem and/or find information. It is these keywords that form search queries and in turn, produce search results. Every company in the world wants to be at the very top of search results, among the dizzy heights of Google’s first page, and not be buried in the murky depths of page numbers with double digits where they won’t get seen. It’s not rocket science… the companies that rank highest among potentially millions of search results are the ones that will get click-throughs to their websites. And it is this reality that forms the basis of SEO (Search Engine Optimisation) – making a concerted effort to appear higher in search results in order to attract more clicks and therefore more customers/business/money/fame/fortune. So, how do we do this? What’s the secret? There are a multitude of ways to improve your SEO, getting you closer to the people you want to convert, but it all starts with some elbow grease and some in-depth keyword research. In this post, we’re going to show you how to do this but it’s first worth noting that not all keywords are equal. Some keywords are more popular (a movie star for example), others are seasonal (‘Christmas lights’) and can be location specific (‘Builders in Birmingham’) or even run with current retail trends (e.g. those fidget spinners every kid in Britain is currently mad for). Traffic can therefore be very high for some keywords but low for others. As you can see, the problem with keyword “Birthday cake” is that your cake company is going to be competing with 1,829,999 others to get to that top spot. That’s some stiff competition, especially if you’re a new business and haven’t been in the game for long. And the name of this particular game is looking for those keywords that generate a decent amount of traffic but won’t obliterate your business with millions of other search results. There’s a fine balance –you want to go after certain keywords but don’t waste your efforts on those that you’ll realistically never appear on the first (or even 4th/5th/6th) page for. Something else to consider before you begin your research is the intent of the searcher. “I want to buy a new hat online” is simple enough for retailers to gauge but perhaps the user wants help completing a tax return and an accountancy firm, for example, has the opportunity to tap into this intent by offering free guidance. Content marketing isn’t always about making a hard sale but it will draw customers into your marketing funnel and hopefully convert to business later down the line. So, let’s get down to the actual keyword research methodology. Now, whilst there are different approaches to tackle this research, this is the straightforward system that we use for The Blue Cube’s clients, seeing successful results again and again. The timeframe for this exercise is usually a day or less and it’s time well spent as you’ll end up with a shortlist of the most appropriate keywords to target. Start by using a tool like Answer the Public or Google Trends to come up with some initial ideas. You can even have a play around with Google search keying in ‘short-tail’ (1-2 word) search terms that are most relevant to your brand. By scrolling to the bottom of the search results, you’ll see that Google provides suggestions for related searches and this offers even more options to explore when it comes to your keyword research. Hubspot recommends creating 5 to 10 topic ‘buckets’ as a starting-off point. Then have a think about your ideal customer (it helps if you’ve already created target audience personas) and try to imagine what type of thing they would be searching for. Our aforementioned accountancy firm, for example, might choose keywords like ‘Birmingham accountant’, ‘tax returns’, ‘company accounts’, ‘small business accountants’ and ‘bookkeeping advice’. Once you’ve got your starter pack of keyword themes, you will need data for these. We recommend using Google AdWords’ Keyword Planner but you will need a live AdWords campaign in order to get the most from this tool. Unfortunately, without a live campaign, you’ll only be able to see broad ranges for search volumes, which isn’t much use to anyone. If you don’t already have a live AdWords campaign, you can set one up with a low daily budget and wait 24 hours or so. Part of Google’s advertising platform, the Keyword Planner is a great way to see how popular and competitive keywords are. You can even target specific locations or areas within this. Insider tip: Other keyword research tools are available but the good ones aren’t free (or cheap). You can be cheeky by signing up to Moz’s Keyword Explorer 30-day free trial and then close the account before they start charging you. People already signed up with Hubspot can use their keyword research tool at no extra cost, which is great. Download this list and either save it on your computer so you can open it up in Microsoft Excel or Numbers, or save it directly to your Google Drive. Repeat this step for each of your starter keyword buckets. Clicking ‘Get ideas’ will again produce a list of keywords. As before, download this list as a file and repeat the task for a few of your key competitors. The next step is to merge all the data documents together by copying and pasting all the data from the individual lists into one master document. You can choose to delete the AdWords-specific columns you don’t need. ‘Ad group’, ‘Currency’ and all the ones to the right of ‘Suggested bid’ are pretty much redundant. Once all the keywords are in one document, you’ll need to get rid of the duplicates (there will be quite a few!). If you’re using Google Sheets, an add-on can help you do this and we recommend Power Tools. ‘Opportunity’ (keywords that may not be relevant for your existing product or service but could be included on your development roadmap. Work through the whole list identifying the best keywords for content purposes and add a ‘Y’ next to these in the ‘Content’ column. Next get rid of any data that’s not relevant to your product/service or that has a low search volume. Firstly, delete any keywords that you’re not interested in then sort your spreadsheet in order of ‘Avg. Monthly Searches’ with the highest at the top. 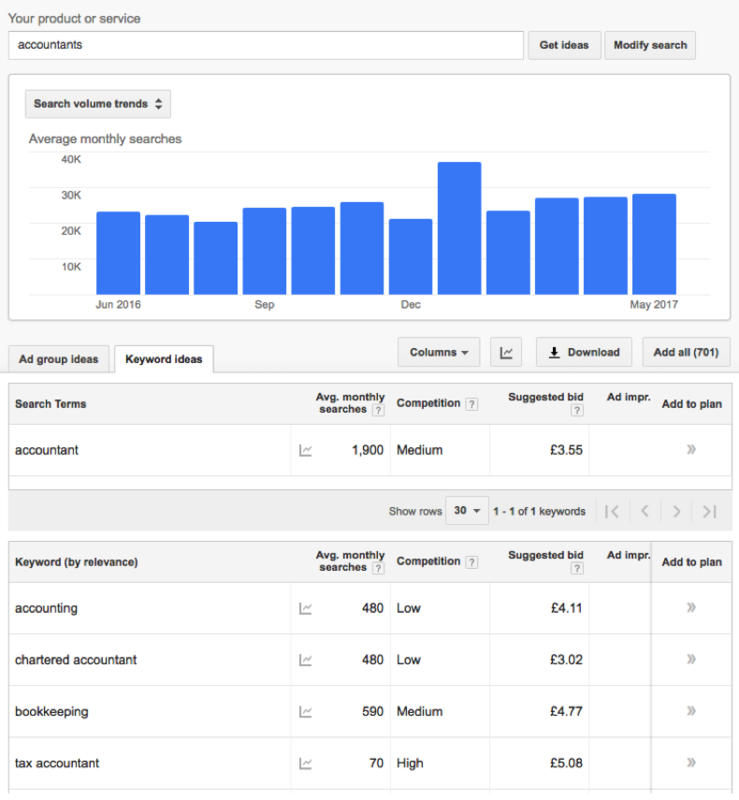 Work out what your minimum number of monthly searches is, i.e. how many people in your target area are searching for that term (if it’s really low, it’s highly unlikely you’ll get any business from that keyword even if you manage to rank first) and delete everything below it. Although you may want to keep some low traffic keywords that have the potential to generate good content. This next step involves getting out your fine toothcomb so be prepared for it to take time. It’s worth noting that the keyword data that Google’s Keyword Tool provides is exact-match data, meaning it gives you traffic for those exact words and phrases. However, that’s not really how Google works. The search engine is clever enough to produce the same results for ‘Birmingham accountants’, and ‘accountants in Birmingham’ or even ‘Birmingham accountancy firms’. This is known as ‘semantic search’ because it focuses on the context and intent of the search query rather than the exact words used. 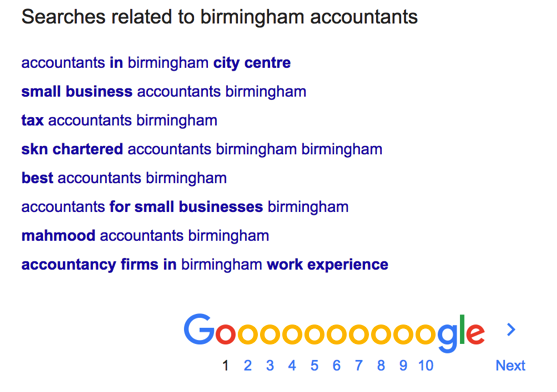 So, if you rank for ‘Birmingham accountants’, you’ll rank for very similar keywords as well because Google understands that they all mean the same thing. Remember this when creating your shortlist as there is very little point in tracking several almost-identical keywords. Go through each of your keywords and have a good long think as to whether you want to target that keyword, whether it would be good for content creation or whether it could be a good area for you to focus on in the future. Use your new columns to indicate your decision. Be ruthless when deciding what you’re going to target. 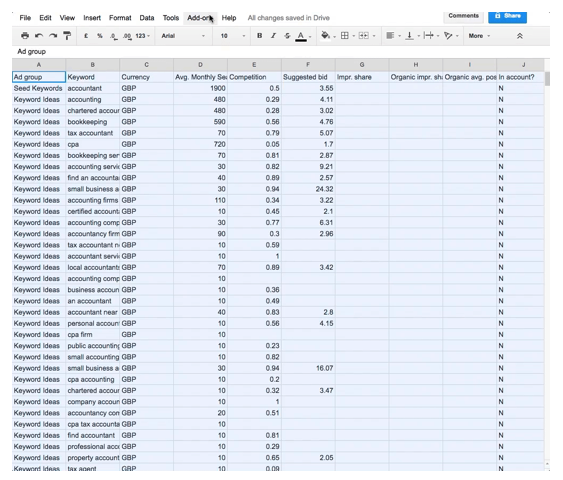 We’d recommend no more than 25 items in the ‘Target’ column of your spreadsheet. 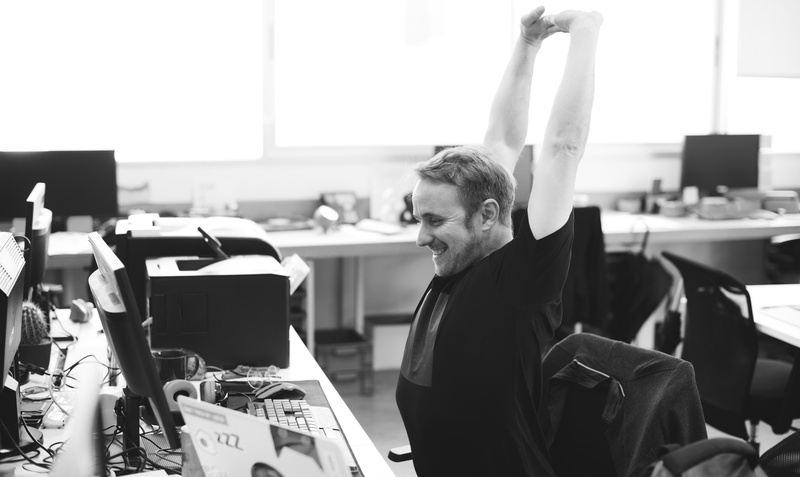 Copy and paste your shortlisted keywords into a fresh document and assign a theme to each; these are likely to be the buckets you identified initially, but not necessarily so. You may find that your research uncovered new keywords and themes that you hadn’t considered at the start of the process. The purpose of this step is to group your keywords by theme and these individual themes act as your highest-level keywords. Set up tracking so you can monitor your rankings for the chosen keywords in order to ascertain how effective your SEO efforts are in the future. This can be done with a lot of free and paid tools, including SERPLAB (free), Moz (paid), Unamo SEO (paid, formerly Positionly), and Pro Rank Tracker (paid). Make sure you tweak your settings so you’re tracking your results against your targeted local or national area. Finally, it’s time to produce some great content around your chosen set of keywords to help boost your search rankings. It is also a good idea at this stage to review your website to make sure your existing content is in line with these new keywords. Hubspot have got a great on-page SEO template that you can use to guide you. Good luck with your SEO journey and here’s to some excellent rankings!